#stampinup This week's challenge at the Stamp, Ink, Paper challenge blog is a card maker's choice. We can use anything we want on our card. Such freedom!! When I saw the challenge, I knew it would be the perfect opportunity to CASE a card by one of my all-time favorite stampers,Ilina Crouse. Here's Ilina's awesome card. I started with a Thick Whisper White card base, cut lengthwise. 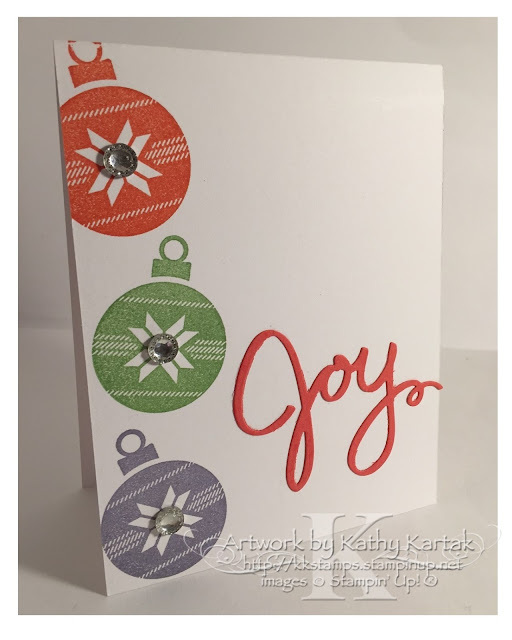 I stamped the ornament from the "Lots of Joy" stamp set onto the card in Wisteria Wonder, Wild Wasabi, and Calypso Coral. I added an Iced Rhinestone Element to the center of each ornament. Next, I cut the word "joy" from a piece of Calypso Coral card stock using one of the Wonderful Wreath Framelits. I adhered it to the card with the Fine-Tip Glue Pen. So quick and easy--and clean and simple. Thanks for the inspiration, Ilina! !